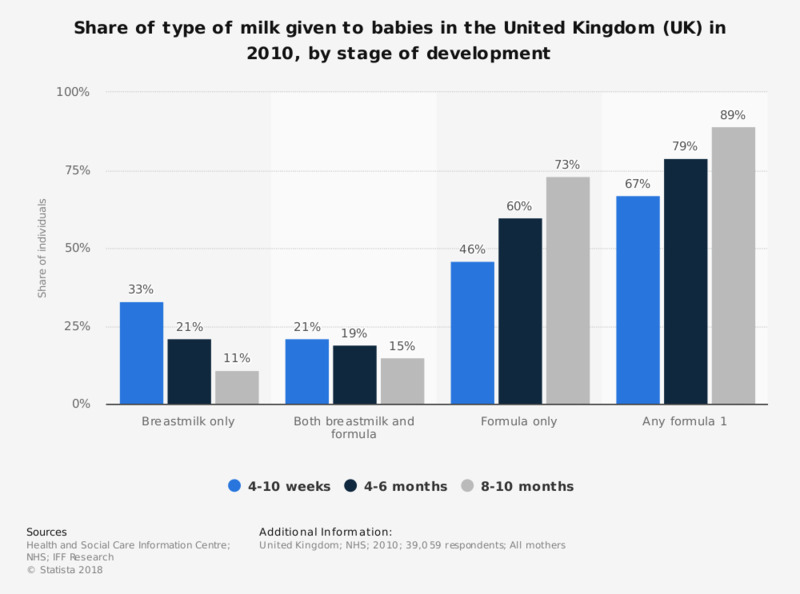 This statistic displays the share of types of milk given to babies in the United Kingdom (UK) in 2010. According to the results of the survey 28 percent of babies aged 4 to 10 weeks only received breastmilk only. The Infant Feeding Survey is conducted in the United Kingdom every five years. As such, the latest survey was conducted in 2015, with results expected to be released in 2017. * Milk given in the last seven days of each stage. Statistics on "Infant feeding in the United Kingdom (UK)"
If you breastfed, or are planning to, what is the main reason for your choice? What is/was your main fear about breastfeeding? Ideally, how long should a baby be breastfed? If you breastfeed your baby, how long did you breastfeed or do you intend to breastfeed? What is/was the most challenging place you have ever breastfed? What is the most challenging part of breastfeeding for you? Have you ever been openly criticized or experienced prejudice while breastfeeding in public? What would have helped you breastfeed for longer?